Body Wraps to Lose Weight - Body Wraps - Weight Loss. Effective Body Wraps for Weight Loss. Looking fab in your bikini is a top priority for most girls, but melting those inches off your belly or thighs can be super difficult. However, fortunately there are various body wrap treatments for weight loss that can help you with this problem, so if you're ready to help your body get in perfect shape turn towards any of the following body wraps. These body wrap treatments are best done in salons as they're quite messy and a little pampering session is more than welcome especially after a long week at the office, but if you're feeling brave and want some alone time pampering you can do these treatments at home just pick one that doesn't require a thermal blanket. Slimming body wraps work by eliminating fluid retention, so give these treatments a try and watch them work their magic. Algae and seaweed are packed with minerals and enzymes and can do wonders for your skin. They help by stimulating blood circulation and help the body eliminate toxins through sweat. This body wrap treatment combined with the pressure of the foil wrapping your skin will get you up to 1 inch slimmer after just one session which lasts between 1 ½ – 2 ½ hours. This body wrap to lose weight involves the use of grounded coffee, hot water and clear foil to effectively melt inches away. Coffee stimulates blood circulation and reinvigorates the skin, leaving it feeling taught and soft. This body treatment can also be done at home with minimal costs, so wrap yourself in this natural body treatment and let it work for about one hour before rinsing off and moisturizing the skin. Chili is a great ingredient if you want to melt fat away. The active ingredient, capsaicin, helps promote blood circulation and water retention drainage and the effects are visible from the first session. Besides the fat burning properties, chili body wraps are also effective in banishing cellulite, so no wonder it a favorite for women. However, there's a downside to this body wrap as the burning sensation creates discomfort for many women and some can even develop an allergic reaction. Keeping the chili mixture away from your genital area and cleansing the skin well after application are musts when it comes to the chili body wrap. The good thing though is that you can lose up to an inch during a one hour long treatment session. Herbal wraps are usually performed in salons as the treatment combines the benefits of herbs and oils with the pressure brought by hot compression wraps. 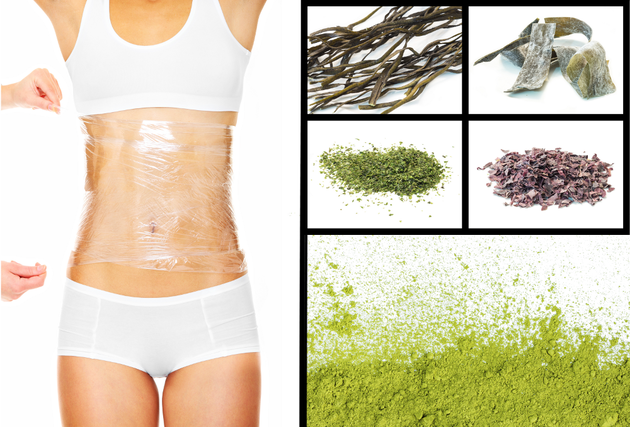 These wraps are drenched in the herb - oil concoction and tied around the body to cleanse and repair tissue, eliminate cellulite and fat cells. Glowing skin and a tighter appearance are also a result of this natural body treatment, but keep in mind that slimming effects are not as obvious post one treatment that is why most salons recommend a series of herbal wraps for optimal results. This cool and refreshing marine seaweed treatment is perfect for those dealing with fluid retention. Perfect for the hips and thighs, the Frigi Thalgo body wrap helps eliminate excess fluid and toxins, improves the skin's elasticity and the appearance of cellulite, and revitalizes tired legs. The one hour long treatment is done with the help of compression wraps and is usually accompanied by a short massage session.